Redbet are giving away 10 free spins with no deposit required on the brand new NetEnt slot Koi Pricess. The No Deposit Bonus is for new and existing players! Plus, Redbet Casino are running a promotion where you stand to win a VIP trip to Japan for two! 2 Open a new account with Redbet Casino via our special links. Click here !!! This offer is valid for new players arriving from BetAndSkill.com. A 'Like' on Betandskill's facebook, Google+ page or twitter profile is required. Only players from the following countries are eligible to take part in the campaign: UK, Sweden, Finland, Norway, Iceland, Germany, Austria, Switzerland, New Zeeland, Australia, Netherlands, Canada & Italy. The free bets are not all! You can participate in the Koi Princess Fortune promotion to have the chance to win an exclusive VIP-trip to Tokyo. Play a minimum of 20 rounds on Koi Princess with a minimum 0.20 cents per spin. For every 20 spins you play you’ll receive 1 ticket to the prize draw, you can collect a maximum of 50 tickets per day so come back every day to get your tickets. 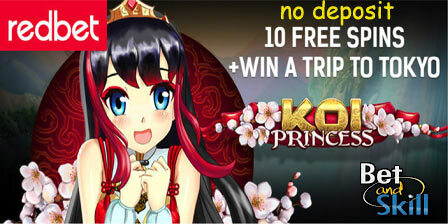 "10 Free Spins on Koi Princess slot at Redbet Casino + Win a Trip to Japan"